On 17 April 1996 a massacre occurred in the southeastern corner of the Brazilian Amazon. 21 members of the Brazilian Landless Workers’ Movement (Movimento dos Trabalhadores Sem Terra or MST) were killed by paramilitary forces while marching from Curionopolis to Marabá as part of their struggle for agrarian land reform. Among the dead was a high-school student, Oziel Alves, who is reported to have died screaming “MST”. 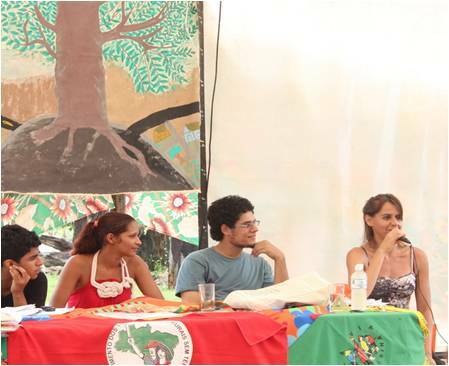 Seeking to pay homage to their fallen comrades, and transform the symbolism of the space from one of oppression to one of hope, survivors of the community have created an annual ten-day educational event – the ‘Oziel Alves Pedagogical Encampment’ – leading up to the anniversary of the massacre. Having just participated in the various activities of the MST’s pedagogical youth encampment, I report back upon the spaces of critical learning that the encampment enables, and offer insights into the intersections of critical geography, resistance, memory, and education. Land ownership has historically been unequal throughout Brazil, and there have been numerous state-led and popular attempts to resettle the landless in Amazonia (Foweraker 1981). Dissatisfied with a perceived lack of attention to the structural inequity underlying land concentration, social movements have become vocal and powerful actors in Amazonian agrarian reform (Simmons 2004). 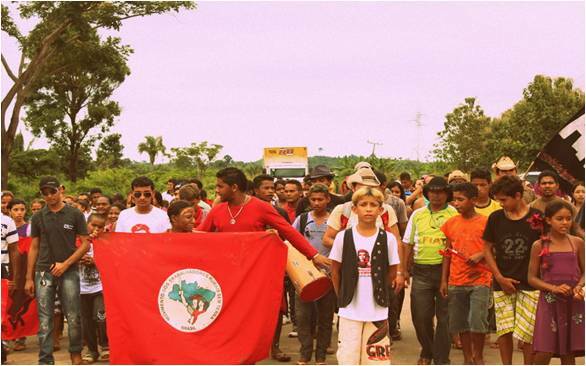 The MST is often considered one of the most successful social movements in Brazil, and seeks agrarian reform by occupying land it deems ‘unproductive’ (Branford and Rocha 2002; Wolford 2006). Tragically, violent conflicts such as the Eldorado dos Carajás massacre (named after the municipality it occurred in) have typified the landscape of the southern portion of the state of Pará (Simmons 2004, 2005; Simmons et al. 2007). As the MST is concerned with transforming the landless into empowered agriculturalists, the struggle for education is as central to its ideology as its demand for land (Branford and Rocha 2002). Seeking to make the land and its landless members ‘socially productive’, formal and informal education play key roles in the MST. This integration of education – along a continuum from formal to informal learning opportunities – with radical political action has been well studied by educational scholars (see Welton 1993; Spencer, 1995; Kilgore 1999; Overwien 2000; Walter 2007). Since 2006, a ten-day ‘pedagogical encampment’ has proceeded the annual vigil that occurs on 17 April. In analyzing the radical educational space of this pedagogical encampment, I draw on Foley (1999), who defines informal social movement learning as incidental, embedded in action, and not systematized. Within Foley’s conception of informal learning, ritualized spaces, such as political meetings and demonstrations, are sites of pedagogical value. Additionally, I believe the theoretical inroads of David Gruenwald (2003) in constructing a ‘critical pedagogy of place’, are instrumental to understand the transformation of both this space and the MST youth members through the pedagogical encampment. On 8 April, approximately 400 MST youth, ranging in ages from 12 to 30, and traveling from as far as 12 hours away, converged at a curve on a remote Brazilian highway known as the ‘S-curve’ (Curva do S). This place was chosen as the site of the pedagogical encampment because it is the location where the Eldorado dos Carajas massacre occurred. That this area holds symbolic importance is obvious to even the passing tourist because of the monument, consisting of 19 massive burned Brazil nut trees interred in a circle, which the movement constructed following the massacre. Beginning on 8 April, the MST youth transformed the space once again into one of informal and formal learning. Over the next ten days, plenaries were held each day where members learned about pertinent topics such as gender relations, agrarian land tenure, agroecology, and critical cartography. In the middle of each plenary, groups of 15 students would divide off to debate the topics together and derive critical questions, which they returned to pose to the plenary discussants. 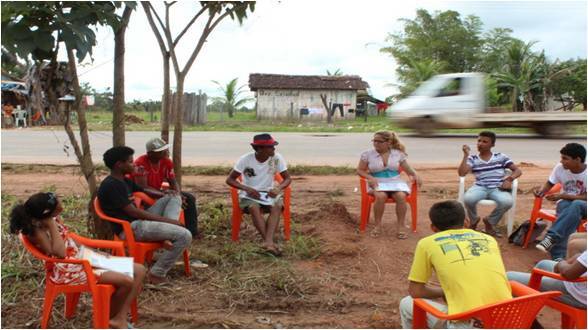 This model of participatory education is diametrically opposed to that of the contemporary Brazilian educational system, and is emblematic of the re-constitution of this tragic space into one of hope. In addition to these more formal educational opportunities, extensive informal learning took place as well. MST youth chaired each plenary discussion, and created misiticas, or pedagogical theatrical performances, that opened each plenary. The youth were also tasked with organizing themselves into nucleos de base, or collectives, which were responsible for the initial construction of living quarters, bathrooms, showers, as well as the ongoing maintenance of the encampment, including the cooking, cleaning, and security for the daily protest. This daily protest, which occurred at 5 pm, involved the occupation of the highway for 21 minutes in honor of those who died in the struggle for agrarian land equality and social justice. During each day’s occupation, a loudspeaker was used to educate stopped motorists, as well as to remind the assembled MST youth about the history of the space, and its transformed nature into of political education. Through the myriad educational activities that MST youth experienced at this annual event significant learning took place. Youth, who began the experience as timid students educated in an oppressive traditional school system, were transformed to those who felt comfortable posing and debating critical questions, such as the relations between pesticides and food sovereignty. From invoking the memory of the massacre, to creating poetry, to organizing daily work teams, MST youth developed as radical subjects through the experience of this annual critical pedagogy of place. 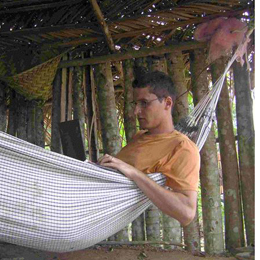 This entry was posted on 10 May 2012 by Antipode Editorial Office in News and tagged Brazil, Brazilian Landless Workers’ Movement, critical pedagogy, education, land ownership, memory, misiticas, Movimento dos Trabalhadores Sem Terra, MST, Oziel Alves, Oziel Alves Pedagogical Encampment, pedagogical encampment, popular education, resistance.